It's an unbelievably overwhelming feeling when something goes wrong with your vehicle. You never realize just how much you rely on your automotive transportation until it's taken from you. A few months ago, my beloved car, which I've had since I was 16, wouldn't start. I couldn't understand what was happening. I consider myself a responsible car owner. I don't miss maintenance appointments. I make sure to address issues as they appear. What was going on? As it turned out, my car was just old. It had turned 10 years old this year, and it was tired. So, I called a tow truck and a mechanic. I called a car salesman and a financing company. I called the doctor's office where I missed my appointment and my friend to get a ride home from work. Within an hour, things were more or less taken care of. But for our customers, it's not that easy. If an accessible vehicle won't start, you often can't call up a friend for a ride home. It takes more planning to figure out what to do with your wheelchair when you can't roll it up into your neighbor's or family member's vehicle and are unable to transfer. And, if you miss something important like a doctor's appointment, the consequences could be even more serious. We think about that a lot at BraunAbility, so we make sure safeguards are in place to protect our customers from being down and out. Our minivans have side doors that operate just like they did when they came from the manufacturer. This means you can open and close the door by pulling on the handle and sliding it open manually. 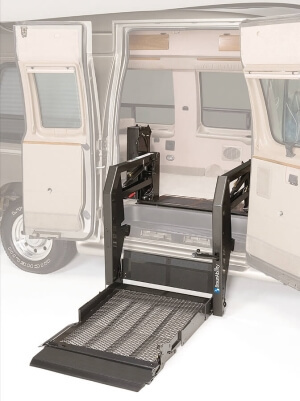 Vans with foldout ramps also have electrical overrides that will raise the ramp and operate the kneeling feature of the van even if the vehicle doesn't start. If you are inside the vehicle in the event of a failure to start, open the door and push the ramp out manually to exit. The MXV, our accessible Ford Explorer, has electrical override switches that operate the door, ramp, and kneeling systems in both directions. Even our lifts have a variety of emergency back-up systems so you can operate them despite a power failure. Your dealer will train you on how to work these systems before you take the product home. When you buy a BraunAbility product, you aren't just buying a van or a lift. You're buying your freedom. Our job is to make sure that freedom is never compromised. You can rest easy knowing that if the worst happens, we've thought ahead to make sure you are safe and secure. If you forget the training from your dealer or the information in this blog, our dealer network offers 24/7 emergency roadside assistance so you can call on them when you need help the most. No matter where you are in the country, BraunAbility dealers are ready and trained to support you whenever and wherever you need it. When your accessible vehicle won't start, your problems can be solved within an hour too, thanks to BraunAbility-engineered emergency back-up systems, our dealer network, and by putting your trust in the BraunAbility name.